In fact, the bug might not be a problem of fsck itself. But first I'll try to describe it. We got VMs here and one user reported after changing /etc/fstab it doesn't boot anymore. With this wrong line in /etc/fstab the boot-process had been hanging (see attached image). When you look exactly you'll notice that /data is missing. But it's not easy to track missing stuff. And now think about this user wouldn't boot after this work in /etc/fstab. Assume he's doing different things and boots maybe next week. In my opinion we would never have found this problem. We wouldn't even search in /etc/fstab. Conclusion: I'd like to have a more verbose output what's been going on here, maybe some kind of error message, like: No filesystem found. Or anything like that. Maybe there are some boot-options which make fsck talk more about what it's doing? 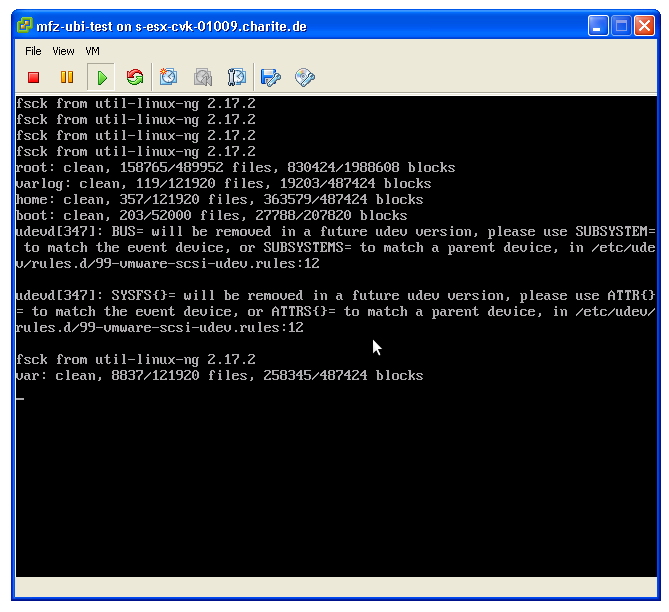 This was at ubuntu server 10.4 (lucid) 64 bit. Maybe it's because someone installed an X-Server onto it, which might change the boot-screens? Thanx for any further help with this topic!